What do you get when you cross a project manager/artist with an event planner/mathematician and throw in a bunch of great couples? The perfect formula for a good time! Step 1: Choose your theme. Brainstorm ideas incorporating your theme, but don’t let your theme control all your planning decisions. You can sometimes take an idea too far. Step 2: Make ridiculously organized multi tab spreadsheets (optional but incredibly satisfying). Step 3: Design an invitation so your guests can get the feel for your party. Send it out early if costumes are expected. Step 4: Get stoked! Gather a whole bunch of fun décor and decorate early (the day before or weekend before) so you can focus on the other details the day of the event. 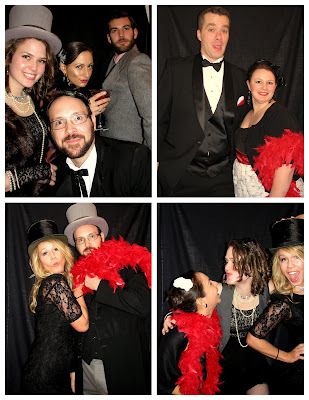 Step 5: Set up a photo booth so your guests can bust out their crazy on camera. We just used a digital camera with a flippable view screen, a tripod, and a black tablecloth. Step 6: Give your guests some fun surprises. 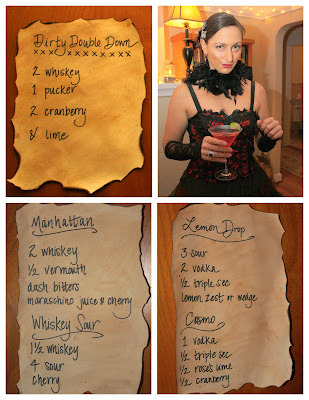 Step 7: Create a signature cocktail! Step 10: Make sure everyone has a safe ride home. A big thanks to Brittany for being the best co-host and friend a girl could have! And a shout out to our awesome, hilarious friends for knowing how to BRING IT!